Purple Potato Majesty produces a large number of small- and medium-sized potatoes that are uniform in shape. 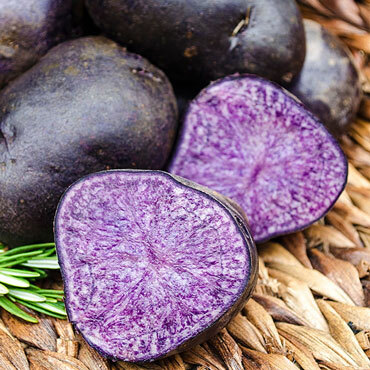 The stunning, deep purple color of both the skin and the inside of the potato will wow family members and guests alike, especially when used for purple French fries or purple mashed potatoes! Their deep purple skins and delicious buttery flesh are high in anthocyanins (an important antioxidant), and like all potatoes, they contain Vitamins C and B6 to protect against cell damage and promote a healthy heart. Bred specifically for frying, also try them baked or boiled. Use it with our Vegetable Cutter to get perfect, uniform French fries in two different sizes. 80-100 days to maturity. Height: 18 - 24 inches. Spacing: 12-15 inches apart in rows 30 - 36 inches apart. Depth: 3 - 5 inches. Days to Maturity: 80-100 days. Main season variety. Fruit: Deep purple color inside and out.